Most video players that you run on desktop PCs and even many mobile media players support zooming. You can zoom any video that you play in these players using built-in controls. In VLC Media Player for instance, a popular cross-platform media player, you can zoom using the Z-key, and do then reverse with Shift-Z instead. YouTube, and most online video services, don't support zooming at all. While you can zoom the pages, doing will leave the video untouched usually. Zooming can be useful in certain situations, usually when you want to take a closer look at something that is displayed in a video. YouTube users have two main options when it comes to the zooming of videos on YouTube. 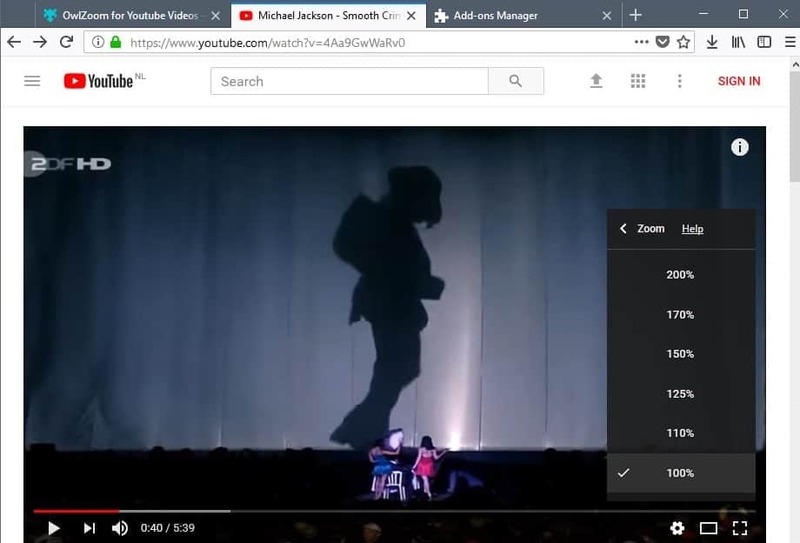 Use a web browser extension to add zooming capabilities, or use a third-party video player with zooming functionality to play YouTube videos. OwlZoom for YouTube Videos for Firefox -- The WebExtension adds a zoom entry to the YouTube settings button. Click on it to activate it, and display the different zoom levels the extension supports (between 100% and 200%). The new zoom level is applied automatically. Note that this will show only part of the video on the screen. Once done, click on the new zoom icon in the main player toolbar to activate the selector to display a certain zoomed in part of the screen in the player. You can go back to normal by selecting 100%, or using the shortcut Shift-B. Zoom for Chrome -- Designed primarily to zoom entire web pages, the extension will zoom videos on YouTube as well by enlarging the player area. Other extensions, Magic Actions for YouTube for instance, may enlarge the player area up to the full size of the browser window. While that is not zooming, it may be sufficient for some users who want to see more details on the screen. The second option is to use a local video player that supports YouTube videos and zooming. You can use SMPlayer's SMTube for that for instance. It is an add-on for SMPlayer that you need to install separately. Once installed, you may use it to browse and search YouTube using it. Any video that you want to play is sent to SMPlayer's main player interface where it starts to play. You can then use the program's zoom options, accessible via Video > Zoom and shortcuts, to zoom the video that plays. Find out how to zoom YouTube videos using easy to use and install browser extensions, or third-party media players that can play YouTube videos. I always download Youtube videos (HD) and play them with VLC. VLC is blocked to go online. The “Z” function does nothing on my computer when viewing downloaded YouTube videos on VLC. It SAYS it is zooming in the upper RH corner, but nothing actually happens.